In Minnesota, we are very familiar with snow and ice. Most often, we think of it when it is right in front of us, in our driveway or on our sidewalks or roads. A spot often overlooked by many of us, however, is the threat above us. At Zablocki Roofing, we provide roof snow removal services for homes that experience a significant amount of accumulation on the roof. Hiring an expert to remove the snow from your roof ensures you that your home will stay safe and free from problems that can arise from snow overload. One of the most dangerous situations that results from winter weather is the heavy load accumulated snow can put on a roof. Depending on how and when your home was built, heavy snow can cause a roof to collapse, endangering the lives of your loved ones, ruining your home, its contents, and causing a huge financial loss. Roofs with steeper pitches fare better than those with a low pitch because gravity will work to slide snow down. 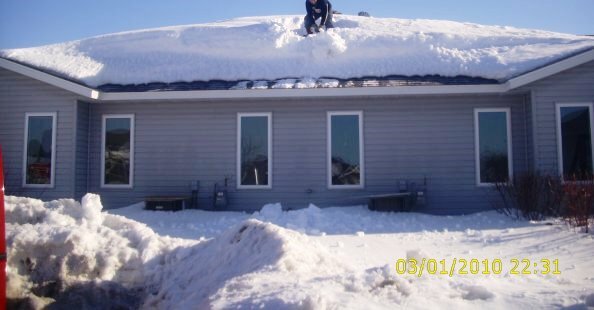 Wind can cause snow to drift on roofs, resulting in uneven snow loads. Multi-level roofs are especially prone to drifting. It is estimated that a foot of light snow weighs approximately 5 lbs. per square foot, with wet or heavily-packed snow weighing as much as 10 to 20 lbs. per square foot. Snow that thaws and refreezes can add an additional 40 to 60 lbs. per square foot of weight to your roof. Snow may also plug sewer vents, causing sewer gas to back up in your house. In addition, snow can cover up your roof vents or ridge vent, trapping moist air in your attic. When this happens, warmer air will freeze to the bottom of your roof and form frost. Once outside temperatures warm up, the frost will melt, causing leaks in your house. Ice building up on the eaves of your roof can lead to ice dams, which can assist water in backtracking up your roof under your shingles. Ice dams occur as a result of heat loss, or during the freeze thaw cycles when snow melts during the warm daytime temperatures, and freezes along the roof edges at night when the temperatures drop. We are often asked whether or not ice dams should be removed to avoid leaking, and Zablocki Roofing always errs on the side of caution and recommends ice dam removal to preserve the integrity of your roof. Removing snow from rooftops is dangerous and should be left to a trained professional with the proper safety equipment and tools. Not only do people fall and incur serious bodily injury when cleaning their own roofs, their inexperience can cause costly damage to shingles and eaves. Depending on the weight load, roof pitch, drifting, etc., snow must be removed in a particular pattern to avoid causing instability as the work progresses. Ground snow removal equipment is not suited for rooftop snow removal, and can cause extensive damage to the roof, to any skylights, vents, antenna lines, electrical lines, gas lines, etc. For the safety of your family, friends and property, call the experts in rooftop snow and ice dam removal at Zablocki Roofing. We will take the appropriate measures to protect your landscaping, air conditioners, furnace exhaust/intake and gas meters. We can also remove large piles of snow that accumulate in front of doors, windows, sidewalks, decks and driveways during rooftop snow removal if needed. Contact us today for more information.